Sheffield City Region will elect its first metro mayor in May 2018. The metro mayor has control over the whole Sheffield City Region combined authority area. He works with existing city leaders to take forward their strategic plan. You can find out more about the new metro mayors on our FAQ page. 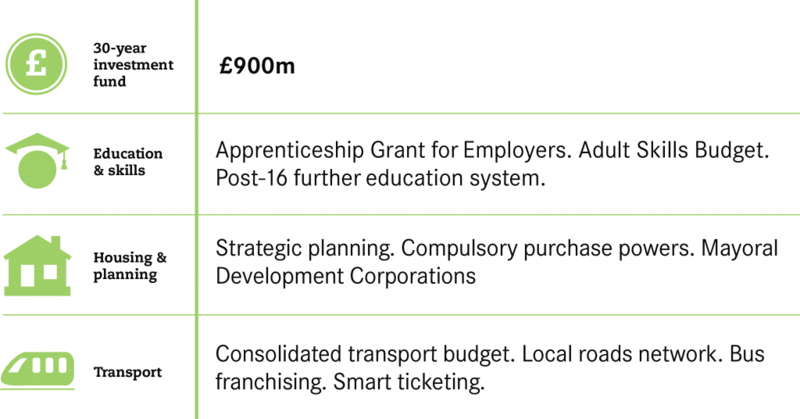 How does Sheffield City Region perform in terms of jobs and productivity? What do local people want from the new metro mayor? Sheffield City Region elected its first metro mayor, Dan Jarvis, in May 2018. This briefing brings together the key facts about the city-region’s economy. It asks what local residents see as the top priorities for the new metro mayor. It also asks what previous elections tell us about voting patterns in the area. Sheffield City Region consists of the following local authorities: Barnsley, Doncaster, Rotherham and Sheffield. Understanding how the city-region performs on key areas such as productivity and employment will help the new metro mayor to assess what they should prioritise. The table below shows how Sheffield City Region compares to the UK average. Source: All data is publicly available. For full source details contact Centre for Cities. Averages displayed are either UK or GB depending on data available. Introduce a clean air charge to tackle poor quality in parts of the city region where it is most acute. Use new franchising powers to take control of city-region bus services to better serve the population and reduce car journeys, congestion and emissions. Read more about this priority here. It also provides a clear signal to both public (e.g. NHS, universities) and private sector stakeholders the approach that will be taken to development in the area, increasing certainty. Improve the skills of those with few or no qualifications to improve their chances of employment and the city region’s attractiveness to business investment. What powers does the Sheffield City Region metro mayor have? Below is a summary of the powers the new Sheffield City Region metro mayor will have, subject to public consultation and Secretary of State order. What is the political landscape in Sheffield City Region? Labour’s Dan Jarvis won the mayoralty with 55% of second preference votes. Ian Walker, Conservatives, came second with 19% after second preferences. Hannah Kitching then followed for the Liberal Democrats with 10% of first preferences, Mick Bower for the Yorkshire Party came 4th with 9% of votes. Rob Murphy, Greens took 8%, David Allen, English Democrat took 6% and Naveen Judah, South Yorkshire Save our NHS Party took 4% of the vote. Make sure you are up to date on the policies and powers affecting the metro mayors by reading our metro mayors FAQ.